Figure 02 - .3 Surfaces - Definition of Thickness Type "Constant"
I have modelled a precast slab as "orthotropic surface". Can I use these surfaces also in reinforced concrete design? 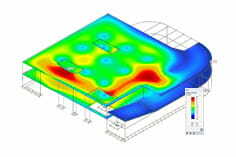 Yes, you can use "orthotropic surfaces" for the reinforced concrete design in RF-CONCRETE Surfaces. If you only would like to carry out serviceability limit state designs, you do not have to define additional settings in RF-CONCRETE Surfaces concerning the surface type. You need the RF-CONCRETE NL add-on module to perform the serviceability limit state designs. Select in the "serviceability limit state" tab (in the dialog box "1.1 General Data") the design method "Nonlinear...". See Figure 01. You can then change the surface type to "Constant" in the dialog box "1.3 Surfaces" so that the serviceability limit state design is also possible here. See Figure 02.